Chip and Joanna make creating that new dream kitchen look so easy. Just knock down a wall, choose a soothing paint color, order dream stone counters and add the perfect pulls. But what about the city inspector checking the structural support, the 76 Pinterest “Perfect Shades of Blue,” walking in heels through a dusty warehouse of huge slabs of stone and questioning whether to pay $1 or $100 for a pull?? 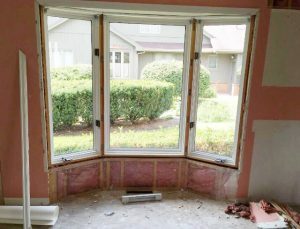 Is your sanity what will need a good Fixer Upper when you’re done remodeling? I’ve been there. 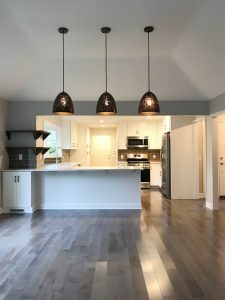 From online “Pinning” all my favorite kitchens to the painful reality of budgets to the unexpected timing of installation to finally cooking and entertaining in my custom kitchen. You can do it. In your budget. In your timeframe. But how? You need someone reliable, trustworthy and experienced. This will be the most important decision of the process! Ask people who will know a good contractor – your Realtor, an interior designer, people in other trades. That contractor will handle all the details – permits, coordinating subcontractors, shopping for big items, floor plan options. Even if you think you can be your own general contractor, you can’t. It’s a lot more than you would want to do and you’ll have enough tasks otherwise. 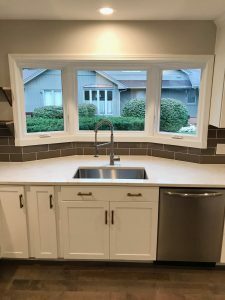 Let him be educated on code for a GFCI outlet so you can focus on the type of faucet you want (one handle, one piece – cleaning around one solid fixture is easier). Walking through a boutique in Columbus, I saw three light fixtures. They were perfect. Long adjustable height to reach from the tall ceilings to the dining table, the perfect mix of rustic with gold accents, the right size for the length of my table. I had to have them. Then I saw the price tag. Ouch. New light fixtures or a new TV? The light fixtures are a focal point and one of my visitor’s favorite pieces. My advice? 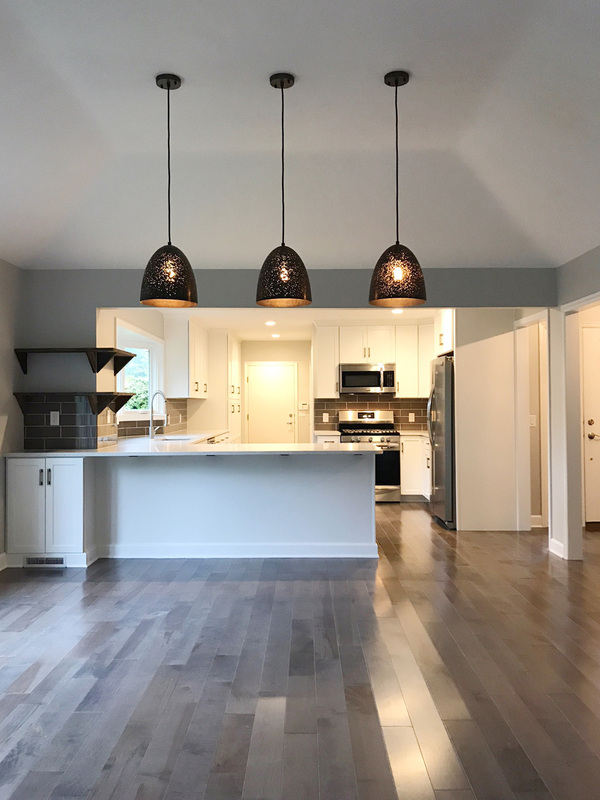 If you have always dreamed of a walk-in pantry, stainless steel appliances, custom range hood (input your dream item here), then make it happen. I could also call this the “don’t screw up your resale” discussion. 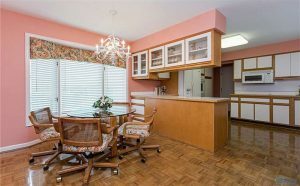 As a Realtor, I’ve seen houses that probably looked great in 1985. But they might not now. Do yourself (and the next homeowner) a favor and use classics for the expensive items. Simple white or natural wood cabinets and neutral colored counters have stayed in style for a long time. Cabinets and counters are the most expensive and impactful parts of a kitchen. Add your own style with a backsplash, light fixtures, pulls or paint. But, keep your main features simple and classic. My vibe is modern rustic. I noticed a theme in my favorite kitchens – open reclaimed wood shelving. 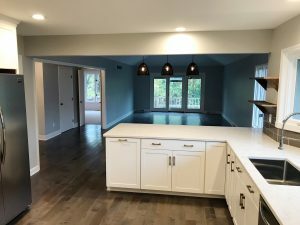 I envisioned an area in my house where I could add a bar and extend the kitchen space with that shelving. My online search took me (and my heels!) to Antique Beams and Boards in Delta to hand pick the perfect rustic piece of wood. 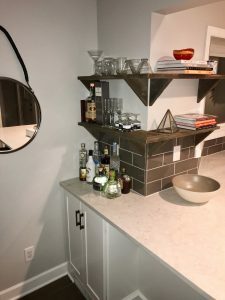 My contractor was able to use that piece to create my favorite part of my kitchen – a custom shelving corner that serves as a bar and area for cookbooks. I had spent months coveting a farmhouse dining room table and eventually found one for a steal. It needed a perfect spot. When designing my new layout, I used the dining table dimensions to plan where my counters needed to end and where lighting needed to be placed. 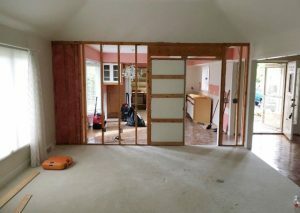 And after I knocked down a wall for my open floor plan, everything was one space. If you have a beloved piece of art, the most comfortable oversized sectional or fave farmhouse table, consider how they will fit and match in the new space. Not just for style ideas on Pinterest and Houzz – two great apps to find design concepts. But to create your floor plan (with the app Home Design) or see a paint color on the wall (with the app Color Snap from Sherwin Williams). It’s the best place to price compare and find the greatest amount of options. I found the same pulls on several sites, but much less expensive on one of them. By the way, pulls or knobs? Knobs. They don’t get caught on your pockets, require less measurement and are easier to switch to change your look! You’ve read this blog. You’re on the way! But, prepare yourself on timing and budget. The clichéd saying – double your time and budget – is only pertinent if you didn’t know what to expect. 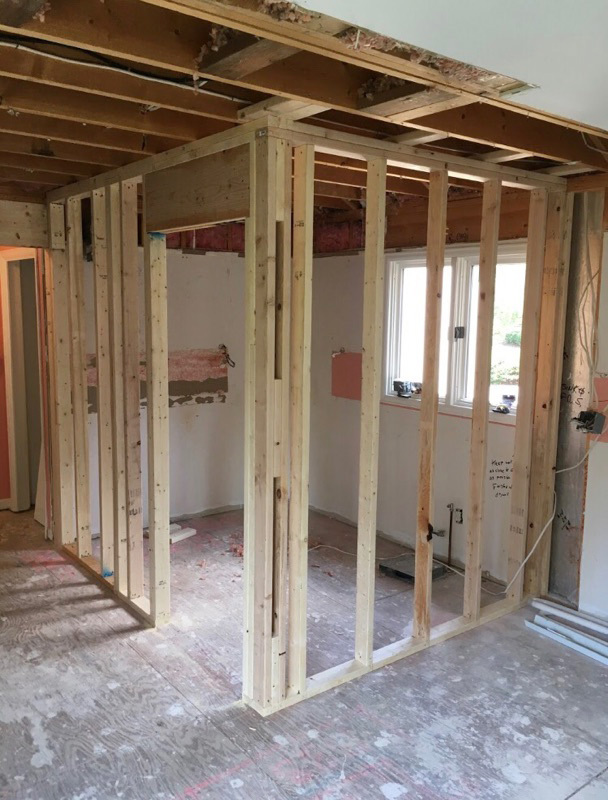 Remodeling your most important and expensive room in your house is time-consuming and expensive. Sit down with your contractor and have a full understanding of how long it will take. 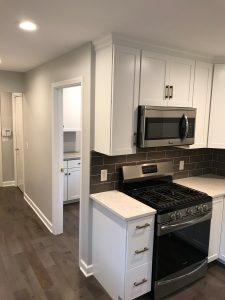 City inspections can take a week, stone counters can take weeks, custom cabinets can take a month. But those can’t all happen concurrently. 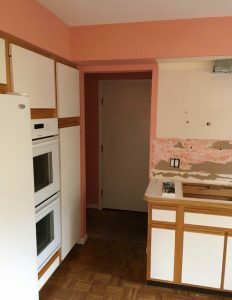 Can you be without a kitchen that long? And understand your contractor’s budget for all the items. 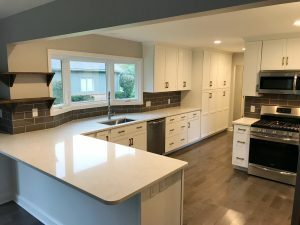 If you must have quartz counters, figure out if that’s in your budget and maybe scale back on your flooring. I saw some amazing backsplash tile, but ultimately decided on a larger scale subway tile to save a few dollars. That gave me room in my budget for the gas range I wanted. 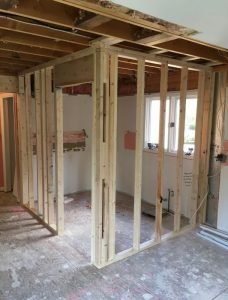 In my renovation process, I found some great ways to save money – although admittedly I didn’t always follow my own advice! But here it is: flooring and appliances can be found at local outlets. Appliance Center has an outlet where you can find discounted high-end appliances. A ding on the side of the fridge that will be covered by a cupboard? No big deal. 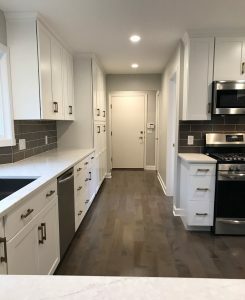 Don’t have a huge area to cover with flooring? Midwest Flooring Outlet may have the perfect amount of in-stock tile you need at a steal. Mr. Direct has trendy, commercial-style plumbing fixtures at half of what I found on other sites. Ikea has some great accessories, counter and lighting options. 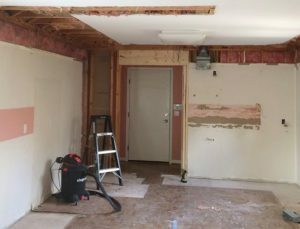 If you want to renovate your kitchen, you should go for it! It’s fun, fascinating, (sometimes) frustrating, but fulfilling. And maybe you’ll just become the next HGTV star! Comment below with your best home renovation suggestions. Melissa is a full time Agent and a Lifetime Member of the TBR Million Dollar Club. She is a Maumee High School Alumna and attended Denison University. She is a member of EPIC Toledo, TBR Affordable Housing Committee, and Young Professionals Network, amongst many other positions within her community and local Real Estate associations.